Greedy Vaccine Makers Use Their Political Influence and Power to Ruin Our Health Through Proposed Mandated Vaccines for Adults! 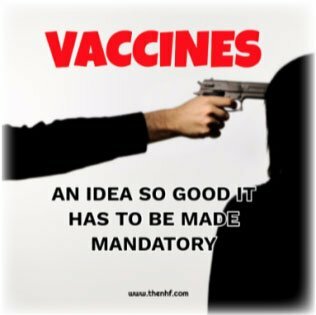 There is a nationwide move afoot to eliminate exemptions to mandatory vaccines and to even coerce all adults into submitting to mandatory vaccinations – all in the name of “health.” And that move is based solely on junk science and contrived news. There is zero science or facts to back mandatory vaccines for adults or for anyone. If this move to inject us all with toxic substances weren’t so serious a design upon our health, it would be laughable. There is also no constitutional authority for Congress to even think about mandating vaccines. Any member of Congress who tries to mandate vaccines is breaking his or her solemn oath of office and should be expelled from office. Unfortunately, all too many legislators are willing to sell their souls for Big Pharma money. The entire way in which this proposed mandate has been initiated, pushed, and supported stinks beyond belief. Based as it is upon a contrived “epidemic” of measles (the Centers for Disease Control & Prevention dictates that three cases of measles constitutes an “outbreak”) and then blamed upon “anti-vaxxers” and the “vaccine hesitant” who quite reasonably worry about the obvious ill-health effects and even death suffered by vaccinated children, this move to force mandated vaccines upon all adults nationwide is outrageous. Instead of focusing upon the millions of vaccine-injured children or other true health emergencies, this Congress is turning its attention to 200 routine cases of measles in a country of 330 million. Some have warned for many years that targeting adults was the logical next step in the pro-vaccine push for greater profits. Only a few believed that this was possible, but now here it is on our doorsteps. Vaccines are highly profitable for the drug companies. Merck itself makes $4.6 million a day on its dangerous and unsafe HPV vaccine. That alone should speak volumes to us about what is really behind this push to vaccinate everyone. It’s not about health, it is entirely about GREED. When I was a boy and had measles, that childhood disease was routine and not even feared at all. We children actually welcomed it! To be able to stay home from government school for several days and watch television while eating ice cream … what a treat! No one I ever knew died from “wild” measles. In fact, in the last ten-plus years, no one has died from wild measles at all, even though some pro-vaccine groups try to pin the blame on unvaccinated children for the single-digits deaths that did occur. Instead, we have life-long immunity, something vaccines cannot confer upon us. Think about it: Good sanitation and true nutrition vanquished measles mortality and are still the mainstay of good health. Last February 27th, the U.S. House Energy & Commerce Oversight and Investigations Subcommittee held a hearing on vaccine mandates. At the same time, there are more than 100 vaccine-related bills that have been introduced in thirty different States. Admittedly, some of these bills expand our rights to exemptions but most do not. Not only are constitutional and individual rights at stake here but also an individual’s right to informed consent to any medical procedure or practice. Many individuals base their objections to vaccines upon their fervently held religious or philosophical beliefs, which should be respected whenever it comes to making their own medical decisions. On March 5th, 2019, the United States Senate Committee on Health, Education, Labor, and Pensions (HELP) held hearings in Washington, D.C. on this nationwide push to vaccinate everyone in the face of this “emergency.” At this hearing, they carefully excluded virtually everyone who opposed mandatory vaccines while pushing forward all pro-vaccine views – and not only from the audience but also from testifying. A balanced presentation it was not. They certainly excluded the National Health Federation (NHF). As NHF president, I reached out to the HELP committee staff and other knowledgeable and politically connected persons in order to try to obtain an invitation to speak before the Committee but HELP Committee Deputy Health Policy Director Andi Lipstein Fristedt never returned any of my calls and messages. Robert F. Kennedy, Jr. was similarly blocked from testifying. Earlier this week, NHF Director of Public Relations Laira De La Vega flew from Los Angeles to Washington, D.C. to attend the March 5th hearing and observe the hearing, demonstrate against the mandate, and also interview those who could shed light on the issues being presented to the Committee as well as those issues being blocked from presentation. She, too, was kept from entering the hearing room despite having arrived at a very early hour and taken her place near the head of the line. One of her interviews can be viewed here, starting in pertinent part at 14:45. The measles “epidemic” has been overblown and used as a tool to fool the public and stampede it into accepting totalitarian measures such as mandated vaccines – a proven cash-cow for the vaccine-makers. There is absolutely NO basis to the scare claims that measles is something to be feared, as can be seen in this excellent article by Roman Bystrianyk. And NHF Policy Advisor Bill Sardi, in his insightful article, has carefully and thoroughly dissected how the vaccine-safety and “anti-vaxxers” could not possibly be responsible for any measles outbreaks in America. It is important for you to read and grasp his ideas expressed there. Use his arguments to make your points with legislators and others. Instead of fixing the quality and problems with the vaccines, the authorities figure that propaganda, a few press statements, and simply forcing everyone to take them is the answer. Any future hearings must be fair, balanced, and include opposing viewpoints. There are many highly qualified individuals to present our opposing viewpoints and it is inherently unfair and unlawful to preclude such individuals from speaking. Under our Federal system, this is a State matter and not a Federal one. Any vaccine issues should be addressed by the States alone. Vaccines are “unavoidably unsafe” as the U.S. Supreme Court has already determined. And to prove the point, more than $4 billion has been paid out for vaccine injuries and deaths. The Department of Health and Human Services (HHS) estimates that less than 1% of adverse events are reported. Mandating any procedure involving such risks is unethical. As has been recently proven in court, HHS has had no problem aggressively promoting more and more vaccines but has completely failed for 30 years in its legal obligation to study vaccine safety. Mandating liability-free vaccines that have not been properly safety tested is in direct opposition to the first tenet of the Nuremberg Code: The voluntary consent of the human subject is absolutely essential and you simply cannot have informed consent when mandatory vaccination is present. Together we can stop this monstrosity from spreading and growing. But it is up to each one of us to fight for our medical freedoms. Believe me, it will only get tougher and less healthy for us if we do not stop this push for mandated vaccines NOW. WRITE YOUR FEDERAL LEGISLATORS (Senators & Representative) HERE. Make Your Voice Heard Now. Thank you to RR for sharing this article with us @ ZEROVAXX!